Lots of interesting things to see in a new program that recently aired on BBC TWO called Make me a German (thanks to Matthias for mentioning the show). The premise is this: A married couple from Britain moves with their 2 small children to Germany for a time to try and discover the “secrets” behind Germany’s success. Topics include “German” work habits, living spaces, child rearing, and socializing. There is a pencil-related item: the husband, Justin Rowlatt, takes a training position at Faber-Castell in Stein. And having visited the factory, I couldn’t help recognizing the places and some of the people that were filmed, which gave me the perfect excuse to post some more photos from that trip. What I enjoyed most about the segments at Faber-Castell was that it showed the grounds, factory, and employees in a way you usually wouldn’t see in a promotional video tour or even during a visit—you get to see a bit behind the curtain so-to-speak, e.g. what to expect—and what would be expected of you—as an employee. Entrance to the parking lot, the Castell castle in the distance. Alas, a-lacq’ are these pencils . Part of his job was to supervise the output of three lacquering machines. 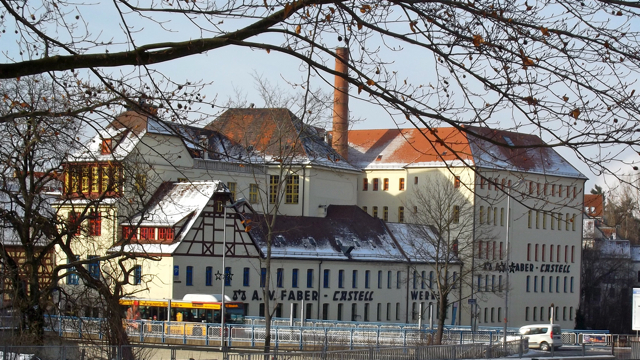 The “old lead factory” across the Rednitz. Co-host Justin Rowlatt gets some face-time with Count Faber-Castell. I enjoyed this show and learned quite a bit from it, but there were some things that left me wondering, vis-à-vis some subtle undertones. The title of the show was the first giveaway: Make me a German. Right from the start it seemingly establishes a sense of “other”, and it is from working and living among this “other” that the hosts purport to deduce and distill the essence of German success. Also it seems an opportunity was lost during their description (and depiction) of Nuremberg at the top of the show; there’s much more to this ancient city than 1933-1945. I’m not suggesting it should be ignored of course, but even just a few more sentences about the city’s industrial history (not to mention Stein’s reputation as the bleistiftstadt), would have nicely tied-together the host’s aims during his stint with Faber-Castell. I honestly believe there is nothing purposely malicious in the program and that its hosts are earnest in their investigation. We all have biases, including mine, but if the show is truly about a sense of success and a type of work ethic, why not call the show something like: Make me Successful. Ep. 1: “How they do it in Germany.” Or how about: Expand my Horizons. Ep. 1: “The steady and relentless success of the German mind” instead of Make me a German. But most importantly, where can we buy some of those Faber-Castell polo shirts? Now this is reality TV I would watch! The anti-German comments and stereotypes on British TV shows are always disturbing to me; it is a form of racism even. You can’t avoid it, even on otherwise great shows like Endeavor or Foyle’s War. There’s always an evil German or blatantly anti-German dialogue. You wouldn’t get away with demonizing any other culture or nation this way, no matter what atrocities they might have committed. But German bashing is just fine. Gosh, wouldn’t it be great if all the evil in the history of the world could be pinpointed to one country in Europe? How much more easily we might live with ourselves!